Many women over the years have been called the “Queen of the Blues.” Bessie Smith (1894-1937), Dinah Washington (1924-1963), Memphis Minnie (1897-1973), Mary Ann Fisher (1923-2004) and Koko Taylor (1928-2009) were all know as the “Queen of the Blues” at various times. However, there is one name that belongs on this list and her absence from this list is conspicuous to say the least. 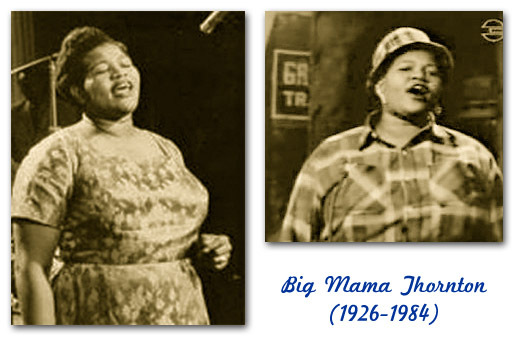 This woman, born Willie Mae Thornton (1926-1984) and affectionately called “Big Mama” Thornton was an American rhythm and blues singer and songwriter. Big Mama has the unique privilege of belting out a hit song called “Hound Dog” in 1952. 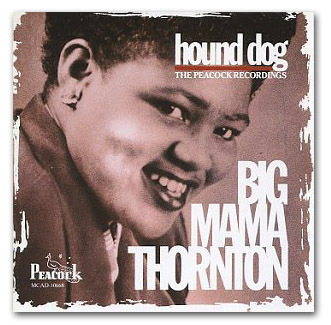 This hit song from Big Mama Thornton charted at #1 on the Billboard R&B charts three years before Elvis Presley recorded his version of “Hound Dog” (which was actually based on a previous version performed by Freddie Bell and the Bellboys). And, the B-side of this record, “They Call Me Big Mama”, sold nearly 2 million copies in 1952. If that wasn’t enough, Big Mama penned a song called “Ball ‘n’ Chain” which she performed as another hit song for her. A few years later, Janis Joplin released her version of “Ball ‘n’ Chain” which became a big hit for her in the 1960s. Big Mama Thornton, besides being an accomplished songwriter and performer, was also a self-taught drummer and virtuoso harmonica player. She often played these instruments on stage when at a performance. Weighing in at 350 pounds, Big Mama had a big voice to match and often dressed in mens clothing which was a reflection of her existence in the rough and violent men’s world of the 1950s. She lived hard and played even harder. Often living in poverty throughout her career, she dropped most of her weight by the 1970s and weighed a mere 95 pounds when she appeared at her last performance in 1984. If you want to hear some blues (the real thing) sung by a real big voice coming from a real big soul, then you owe it to yourself to check out Big Mama Thornton and her wonderful music. And, she certainly deserves to be called Queen of the Blues. Yes she does.